Today in hockey history, a crazy goalie in the crazy goalie era, a playoff beatdown, an embarrassing streak comes to an end, a fact that Jets fans might want to avoid, an Avalanche great sets a team record, and one hell of an eventful day. April 8, 1934 –Red Wings’ goalie Wilf Cude led his team to a 5-2 win at Chicago in Game 3 of the Finals…and he did it despite suffering a broken nose in the second period. And it would still be another 30 years until goalies thought it might be a good idea to protect their faces from flying rubber disks. 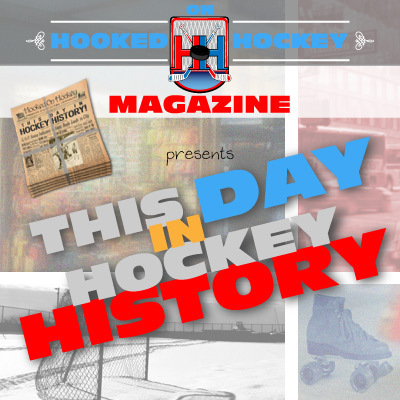 April 8, 1970 – The Bruins scored five goals in a span of 10:21, including two shorthanded goals in a span of 44 seconds (a playoff record), in an 8-2 win over the Rangers in Game 1 of their quarter-final matchup. April 8, 1980 – Doug Lecuyer scored at 12:34 of OT to give Chicago a 3-2 win over St. Louis in Game 1 of the “preliminary round” to end the Hawk’s playoff record streak of 16 consecutive losses, which dated back to 1975. That means they got swept at least four-straight times. April 8, 1996 – The Winnipeg Jets officially announced that their team would be changing its name to the “Coyotoes” for the following season, which really doesn’t make sense for a team in Winnipeg. …Oh. April 8, 2001 – In a 4-2 Colorado win over the Wild, Joe Sakic scored twice to become the franchise’s all-time leader in goals with 457, breaking the mark set by Michel Goulet.